A hiking bugnet review (or bug-net, if you prefer) should begin with the location in which it was tested. I went to the Arctic National Wildlife Refuge (ANWR, or "the refuge") in Alaska, and survived the mosquitoes using this bug-net. Ever seen your arms, legs, torso, and face covered simultaneously with mosquitoes eager to drain you dry? 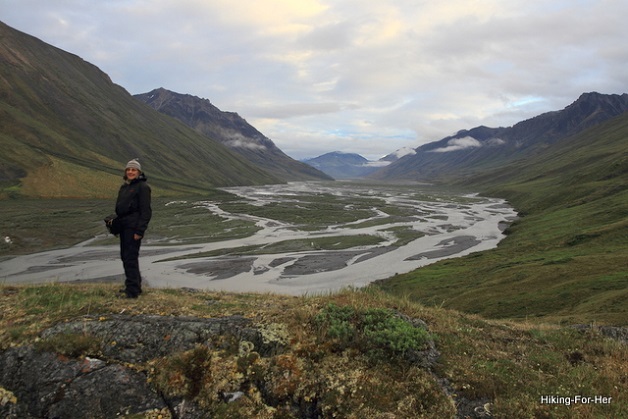 That's what ANWR was like! So trust me when I say that wearing a bug net saved my life. This small but essential piece of hiking equipment was purchased with my own money. No one asked me to write this hiking bugnet review. My only goal: to provide a balanced view of using this bugnet over a two week period in an area with fierce biting insect populations. If you decide to purchase a bugnet using this link, Hiking For Her will receive a tiny percentage of your purchase price, but it costs you nothing extra. 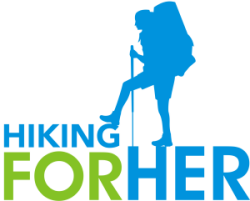 HFH appreciates your vote of confidence, and uses this money to keep the free hiking tips flowing freely! Now let's take a look at this tiny but powerful hiking gear. A hiking bugnet review should be balanced: the good and the bad. Let's start off with the positive attributes, the "pros". $10 US for fine mesh netting that you throw on over your hat, and you’re good to go. Don't fret if you accidentally tear a hole in it by catching it in your jacket zipper, because at this price point you can replace it multiple times and not have to give up your retirement fund. Negligible weight in your pocket or on your head. After a few moments you won't feel it at all. Cinches down around your neck for a custom fit, depending on what else you’re wearing. The net comes with a very portable, squishy stuff sack. But it's small enough that it could easily be overlooked or thrown out as you empty your pockets (thus becoming a "con"). And now for the opposite side of the coin: the things I disliked about this bugnet. You were looking for a balanced review, weren't you? Difficult to eat and drink while wearing! You need to quickly lift the net, gulp your beverage or food, and make sure the little bloodsuckers aren’t inside the net with you as you enjoy your mouthful. Tip: If food odors become embedded in the net, don't bring it into your tent - store it with your bear canister. Everything looks a bit darker even in bright sunlight! This can create problems if you're hiking on a steep slope and need to keep glancing down to maintain your footing. And if you’re having your picture taken in uneven lighting conditions, only the netting will be visible – not your charming smile or wry grin. After awhile, the netting feels a bit scratchy on the face and neck if a breeze is blowing it up against your skin. In my opinion, this little bit of inconvenience is worth the protection against biting insects while hiking. NOTE: You’re still going to need bug repellent for other exposed areas, hands in particular. Two options: DEET, or herbal. I’ve tried both, and the herbal (geraniol & eucalyptus extracts) works as well as DEET on my hands, but needs frequent reapplication. It also smells wonderful, and if I think so, a bear would, too. Although maybe DEET smells good to a bear - not sure! Any strong odor could call in a curious bear. So be sure you're washing up each evening before crawling into your sleeping bag. Clean, non-odorous clothing inside your tent is a must in brown bear (grizzly) country! There is very little downside to wearing a bug net in buggy conditions. I'd never used one before the ANWR trip, but now I'm a believer. In fact, I made room in my survival kit for this little net, and it comes along with me during spring and summer hiking regardless of where I hike. And sanity maintaining, to boot. If the idea of protecting your tender flesh from insect stings is making you happy right now, you can also use protective clothing. Like this bug repellent shirt!